Nancy Ross from Virginia Tech has joined EFree as an Affiliated Scientist. 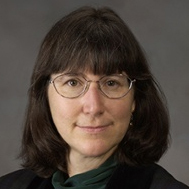 Nancy is an expert high-pressure crystallographer and a former postdoc at Carnegie, recently Associate Dean at VT, and now head of the Geosciences Department. Her research explores the structure/property relations of framework materials at high pressure using a combination of x-ray and neutron diffraction and spectroscopic methods, including inelastic neutron scattering (INS) at the Spallation Neutron Source.